Home / Andrew Garfield / Campbell Scott / Columbia Pictures / Denis Leary / Emma Stone / Irrfan Khan / Marc Webb / Martin Sheen / movie / Rhys Ifans / Sally Field / Sony Pictures / The Untold Story of Peter Parker Begins with "The Amazing Spider-Man"
The Untold Story of Peter Parker Begins with "The Amazing Spider-Man"
Focusing on an untold story that tells a different side of the Peter Parker story, the new film stars Andrew Garfield, Emma Stone, Rhys Ifans, Denis Leary, Campbell Scott, Irrfan Khan, with Martin Sheen and Sally Field. The film is directed by Marc Webb. Screenplay by James Vanderbilt and Alvin Sargent and Steve Kloves. “The Amazing Spider-Man” is the story of Peter Parker (Garfield), an outcast high schooler who was abandoned by his parents as a boy, leaving him to be raised by his Uncle Ben (Sheen) and Aunt May (Field). Like most teenagers, Peter is trying to figure out who he is and how he got to be the person he is today. Peter is also finding his way with his first high school crush, Gwen Stacy (Stone), and together, they struggle with love, commitment, and secrets. As Peter discovers a mysterious briefcase that belonged to his father, he begins a quest to understand his parents’ disappearance – leading him directly to OsCorp and the lab of Dr. Curt Connors (Ifans), his father’s former partner. As Spider-Man is set on a collision course with Connors’ alter-ego, The Lizard, Peter will make life-altering choices to use his powers and shape his destiny to become a hero. In beginning a new chapter in the Spider-Man saga, it was important to the filmmakers to show a side of Peter Parker that moviegoers haven’t seen before. “Since we were reestablishing Peter Parker, we had to build the audience’s relationship with him from the ground up,” notes director Marc Webb. “In order to do that legitimately, we begin the story with Peter Parker as a seven-year-old boy. We see him before his parents left, before they handed him off to Aunt May and Uncle Ben. This allowed the audience to experience the significant emotional cues in his life. “The things that are unresolved, the things we have to live with, send us down a road – and that road can make us better people or not,” says Webb. 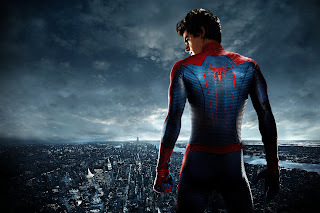 Opening across the Philippines on Friday, June 29 in IMAX 3D, Digital 3D, 2D and regular theaters, “The Amazing Spider-Man” is distributed by Columbia Pictures, local office of Sony Pictures Releasing International. Visit http://www.columbiapictures.com.ph for trailers, exclusive content and free downloads. Like us at www.Facebook.com/ColumbiaPicturesPH and join our fan contests.